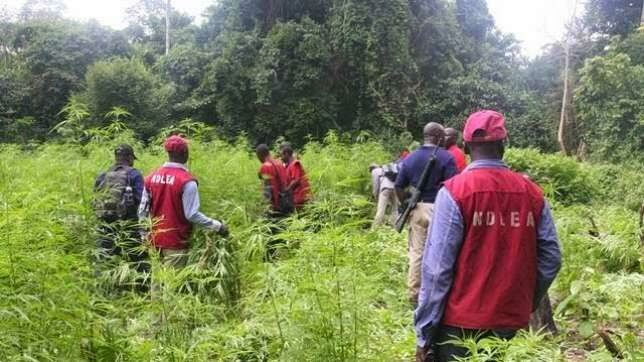 The National Drug Law and Enforcement Agency (NDLEA) says it has destroyed 142 hectares of Cannabis sativa farms in Delta state. The State Commander of the NDLEA, Mr Chidi Obiefule, who made this known to DAILY POST in Asaba yesterday, said that, “The agency seized 46,634kgs of Cannabis sativa, 2.323kgs of cocaine, 14.4kgs psychotropic substances and 71.1 grammes of heroin between 2014 and 2018”, adding that 142 persons who were arrested in connection with the offence are currently facing trial. The commander also said that the agency discovered and destroyed in Asaba, in March 2016, a clandestine laboratory allegedly being used for the production of substances suspected to be Methamphetamine. He said that four Mexicans and five Nigerians suspected to be operating the laboratory were standing trial at the Federal High Court. Obiefule warned the public against allowing unscrupulous elements to build and operate Methamphetamine laboratory around them. He said that such laboratory could pose grave danger to the inhabitants of the locality where it was operated. He explained that the waste products from such laboratory could pollute the source of water supply and the air in such area. The commander advised the public that it was not safe for them to consume the deadly substance, adding that they should avoid the area where the illegal activity was ongoing. Meanwhile, residents of Ogorode road in Sapele are in shock following the recovery of the corpse of a young lady close to a furniture firm. Reports have it that a lady, identified as Philomina Oke, was going to Church early in the morning to keep the Church clean when she came across the body of a young lady lying on the ground by the side of the road. According to reports, the woman, not sure, whether the young woman was still alive, raised an alarm that attracted residents of the area to the scene and when the woman was turned face up it was found out that she was dead and probably must have been dumped at that spot. The Police were later informed and the corpse was removed. Speaking with residents in the area who pleaded for anonymity, DAILY POST gathered that the junction by the company “has become a notorious spot in the area to the end that it is dangerous to walk pass the junction once it is 800pm”. The police image maker in the state, DSP Andrew Aniamaka who confirmed the incident to DAILY POST, said “ the police are investigating the circumstances surrounding the death of the woman, no arrest has been made, the police have deployed more police men to the area, no cause for alarm”.